Since its ’discovery’ some 150 years ago, thinking about endometriosis has changed. With current estimates identifying it as more common than breast and ovarian cancer, this chronic, incurable gynaecological condition has emerged as a ’modern epidemic’, distinctive in being perhaps the only global epidemic peculiar to women. This timely book addresses the scholarly neglect of endometriosis by the social sciences, offering a critical assessment of one of the world’s most common - and burdensome - health problems for women. Drawing on a range of theoretical perspectives, including science and technology studies, feminist theory and queer theory, The Makings of a Modern Epidemic explores the symbolic, discursive and material dimensions of the condition. 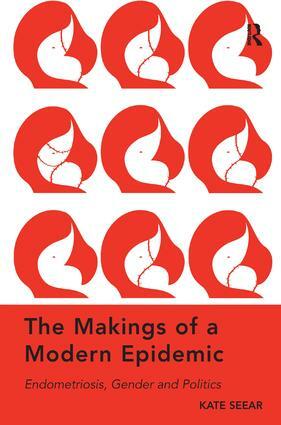 It demonstrates how shifts in thinking about gender, the body, race, modernity and philosophies of health have shaped the epidemic, and produces a compelling account of endometriosis as a highly politicised and grossly neglected disease. Drawing upon rich empirical data, including in-depth interviews with women who have endometriosis and medical and self-help literature, this ground-breaking volume will appeal to scholars and students across the social sciences with interests in gender studies, science and technology studies and the sociology and anthropology of medicine, health and the body. Kate Seear is a Senior Lecturer at Monash University and co-author of Making Disease, Making Citizens: The Politics of Hepatitis C.